It hurts to see our children sad. Just as we comfort an infant in distress, we are inclined to try to solve situations that cause our older children frustration or anger. This action may give temporary relief but is it good in the long run? An article, in the Jan/Feb 2015 issue of Scientific American Mind, points to two research studies that shed light on this question. The studies indicate that as we evaluate potential situations, negative scenarios are not usually as bad as we expect and sometimes the anticipated positive alternative results in disappointment. The upshot is that being happy can lead us to expect too much. Children certainly do not need to be sad or angry all the time, but creating a world of happiness for them can result in children who are not happy enough. Additionally we can keep them from learning to identify other emotions. Instead of trying to create a perfect world, we do better for our children when we teach them emotional competence. 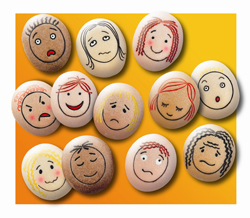 Children need to recognize different emotions and to learn the proper emotional expression. As they grow older, they will be able to choose the emotional response that makes the best sense. They will be able to find the emotion that works. When we assure children that their Heavenly Father loves them, even when sad things happen we help them to gain the perspective that sad feelings do not last forever and that they can help us to enjoy happiness more.